UNITED NATIONS, March 25 -- Following the closed door meeting on Myanmar by the UN Secretary General's "Group of Friends" on Thursday morning, S-G Ban Ki-moon took two questions from the Press. One of his advisors told Inner City Press that both the United States and France have become "more nuanced," with only the UK still beating the drum about what they call Burma. He said that donors like Norway and Australia and Japan are trying to "recalibrate." He snidely pointed out that on roads outside of Yangon, the construction equipment is "all from Caterpillar," the U.S. firm. Meanwhile, India's Tata now plans a truck factory in Myanmar. India is said to be concerned that if they don't invest, Myanmar will become an economic colony of China. Money is talking. Ban was flanked by his interim envoy to Myanmar, Vijay Nambiar and performed under the watchful eyes of diplomats from Friends of Myanmar who urge a hands-off approach. One of these told Inner City Press, before Ban began, that he would mention something about "that lady." Inner City Press was about to say, "The Lady?" but then asked Ban about it. See below. Inner City Press: Mr. Secretary-General, Daw Aung San Suu Kyi has said, she has actually encouraged the NLD not to register for the polls under the current laws. I wonder what do you think can happen between now and when a date is set. Would you view that as a fatal flaw to the election, if the NLD didn’t participate? And are you thinking of naming a more permanent successor to Mr. [Ibrahim] Gambari to carry out the good offices? Some say that having an interim person may either reflect or be interpreted as a lack of commitment on the issue. SG: If what she said is based on her genuine belief, based on the current situations, then we have to respect her decision. I’m not quite sure what the surrounding circumstances were as she made that statement. However, she is the leader of her party and when she said such decision then I think that should be respected. That depends upon how people will decide on that. As a matter of principle, as I have said repeatedly, publicly and privately to the Myanmar leadership, that this election should be fully open, transparent, inclusive and participatory and credible, and I told the Myanmar leadership that without full participation of all the people, including political prisoners, and particularly Daw Aung San Suu Kyi, it may not be regarded as credible and inclusive. Therefore all the process and development, we have to carefully monitor. And about the appointment of Mr. Gambari’s position: at this time I have designated my Chef de Cabinet, Mr. Vijay Nambiar as ad interim Special Advisor until such time when I will be able to find a Special Advisor for that post. Inner City Press: There was at least one report that you proposed a name to Myanmar and they turned it down. Maybe the report was wrong? SG: No. I have never proposed any names. The purveyor of the report was the only other journalist to ask Ban a Myanmar question. Before he did, a UN Security Officer asked him to move away from the meeting room. He maintained to Inner City Press that Nambiar traveled to Myanmar to deliver Ban's letter, and that Ban has received a response that emphasizes Myanmar's sovereignty. Inner City Press asked at the noon briefing for confirmation that a response had been received, but the spokesman merely said he would look into it. Watch this site. At UN, Friends on Myanmar Meet Amid UK Posturing, China Intransigence, Ban Answers? UNITED NATIONS, March 25, updated below -- Myanmar is the topic of a closed door meeting this morning in the UN's new three story building by the East River here, the day after the UK raised Burma in the Security Council, only to have China call it a "sovereign state that must be respected." We will live blog here from outside the meeting. On the run up to this meeting of the Group of on Myanmar meeting, two senior UN officials portrayed the UK and Gordon Brown as opportunistic, trying to take domestic credit for the meeting which was already planned before Gordon Brown requested it. "He did the same thing after Cyclone Nargis," one of the officials said to Inner City Press. "He knew the Secretary General was going, so he called for him to go." The other official told Inner City Press that the UN has advised Myanmar to get better at public relations at the UN. "But they are a military regime, very military minded," the official lamented. The UN would like to rehabilitate their image if not their practices. The Group of Friends of the Secretary General on Myanmar begins meeting at 10 a.m. in the UN's new North Lawn building, followed by a televised stakeout on the building's second floor. We will live blog it below. 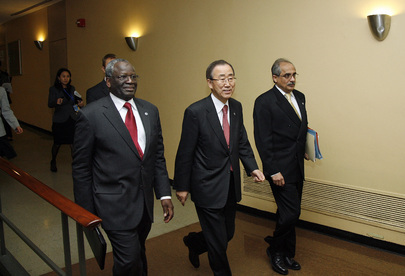 Inner City Press was told late Wednesday that Ban Ki-moon might not take or answer questions after the meeting. Inner City Press: I wanted to ask in the run-up to this meeting with the Group of Friends of Myanmar, Aung San Suu Kyi has said that her party, the NLD [National League for Democracy], and other opposition parties, shouldn't even register for the poll, that the election laws are flawed. I'm wondering; you convened the meeting, what's your thinking of what the UN can do, given that the main opponent now wants to boycott it? We'll see. At 9:30 am, it was announced Ban WILL speak at 11. We will live blog the meeting and stakeout here -- watch this space. Update of 10:15 a.m. -- Outside Conference Room 5 in the UN's new North Lawn building, Ambassador Churkin of Russia and Lyall Grant of the UK walked in and stood speaking. The DPR of India, jovial, arrived, as did Singapore's Perm Rep. Just after 10, Ban Ki-moon arrived, with Vijay Nambiar, Kim Won-soo, Lynn Pascoe and other staff. Of the media, only two cameras were present: Japanese TV and Inner City Press. Next door, a UN Global Compact meeting broke up. UNGC director Kell came out and told Inner City Press, you can't quote us. Is there no press availability? No. This is our first time in the new building, Kell said. Then a UN Security Officer came over and asked to see Inner City Press' credential. Only at the UK. Update of 10:45 a.m. -- unlike when staking out past meetings of the Group of Friends on Myanmar, which were held in the basement of the UN's "old" Conference Building where spokespeople and even Ambassadors would step outside to smoke and talk, including ot the press, this new building is antiseptic. There is no reason for anyone to step out of the meeting room, so no one does. While waiting, a request has been made to the UN Global Compact for a list of its corporate members who do business in Myanmar, and how. Update - stakeout was late, but Inner City Press asked two questions, for this update click here.